Each project has its own unique foundation using trust and the personalities of our clients. What do you want to experience and feel in your home- beauty, calmness, grace, radiance? How do you want others to feel when they come and visit? What colors do you like? What kind of images or art do you like? What do you do for a living? What are your personal interests, your taste in music, art, travel, life? Walk through your home. Spend time in each room and each space you want to transform and contact us with your vision. Drawing upon the inspiration of craftsmen and artisans around the world we create designs and finishes that are all unique to your style. The use of paint is limitless, from childrens fantasy rooms to gilded gold ceilings with raised relief designs, venetian plasters from Europe, antiquing stone fireplaces to add the depth they deserve, custom art to hang on your walls …endless possibilitiesI serve people by assisting them in designing a comfortable living environment in their homes. I help you discover your vision and help create a beautiful, elegant, uplifting, practical, functional home that is perfect for you. MainlyI create a home that reflects who You are. In helping design finishes for walls, ceilings and floors i don’t impose my vision, i assist you in their process. Colors are very important.They express moods, reflections and responses. Colors can energize, stimulate, calm and refresh , and even inspire and heal us. As we go through the process of finding your vision we can then go through many samples that i have created over the years as well as custom made samples to fit your home. We have extensive experience designing Childrens rooms. The thing i love most is helping design a room that will be perfect for a soon to be Mom or a child that will grow with their beautiful fantasy room. There are endless possibilities to choose from and we would design it together! Lisa is all self taught and prides herself on the dedication and the commitment to not only producing quality art but by being able to connect with the people whom she is working for. Now she is on to another vision which is her hand made wood panels . She was inspired by old recycled wood pieces and all of the plaster techniques she has learned over the years as well as her hand painting skills. This home was colored with white polished Venetian Plaster and a wax topcoat in the main areas. The downstairs entertainment area was finished with a platinum silver suede finish on all of the walls and ceilings. Attention to detail was a must in this home. Throughout this home we provided custom finishes on all of the walls as well as all of the doors , baseboards and crown molding throughout. This home was One of Four spec homes. We did a glaze on all of the walls, ceilings and stone throughout the home as well as venetian plaster ceilings with raised relief designs. 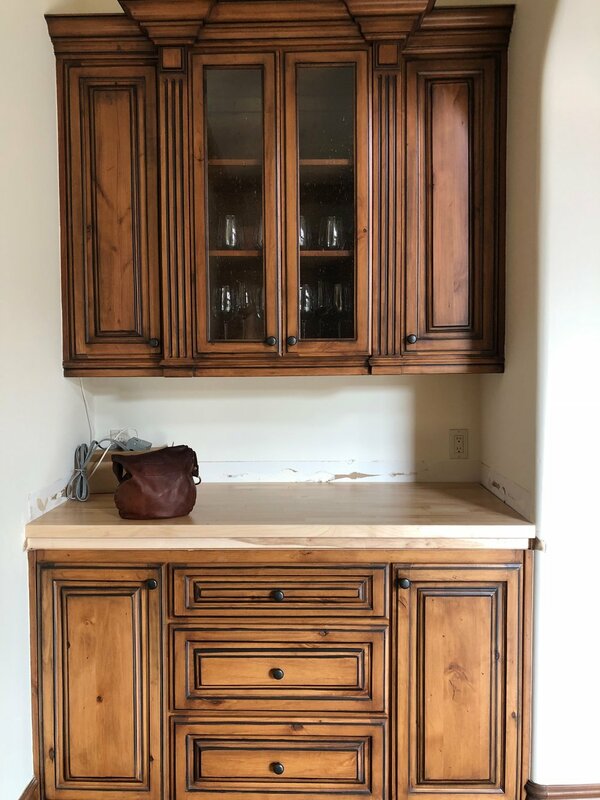 Below are some specialty finishes on Cabinets and furniture that are all custom to the clients home.We specialize in refinishing cabinets with paint that are already existing. The designer wanted to keep this chest because it fit perfectly in the space. I suggested she have us work our magic and paint it to go with the new updated modern decor! This beautiful home was a masculine yet elegant Bachelor pad. From glazed walls throughout the home to add depth to black venetian plaster with gold topcoats in his cigar room. The cigar room was a very special room with gold leaf ceilings as well. His own personal barber shop had faux suede walls to add an extra special touch. All the walls and ceilings have a beautiful soft glaze to add depth to this large home. Faux suede plaster walls and custom paint finish on the cabinets.